"...Enchantingly realized....The film] has its own, securely original cinematic life..."
"...All the meticulousness, intelligence, taste and superior acting that one expects from Merchant Ivory productions have been brought to bear on THE REMAINS OF THE DAY....Continuously absorbing..."
"...The whole movie is quiet, introspective, thoughtful....There are emotional upheavals in it, but they take place in shadows and corners, in secret..."
"...Ponderous, restrained, and achingly beautiful, THE REMAINS OF THE DAY has long been considered one of the very best of Merchant Ivory..."
"Anthony Hopkins turns repression into unexpressed passion in James Ivory's drama....Mysteriously moving." James Ivory directed this quietly moving film set just prior to World War II. 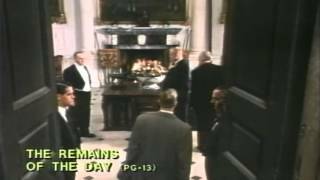 On the large English estate of Lord Darlington (James Fox), a disciplined English butler, Stevens (Anthony Hopkins), devotes himself to his duties with rigorous dedication. Like his father (Peter Vaughan) before him, Stevens lives to serve--to bring order and certainty to the estate's minutiae. Though Stevens has the opportunity to break free of this mold in the form of a romance with the spirited housekeeper, Miss Kenton (Emma Thompson), he chooses to remain within the safe structure of the household, even one that has misguided loyalties to Nazi Germany. Christopher Reeve and Hugh Grant costar as men hoping to show Lord Darlington the danger of his allegiances. THE REMAINS OF THE DAY was Merchant-Ivory's follow-up to HOWARDS END, which also starred Hopkins and Thompson; both actors were nominated for Academy Awards for their roles as dutiful servants in the later film. Set just prior to World War II, this poignant story finds a disciplined English butler devoting himself to his duties at the expense of love and personal freedom. The sensitively handled Merchant-Ivory film received eight Oscar nominations, including Best Actor and Best Actress for stars Anthony Hopkins and Emma Thompson. Theatrical release: November 5, 1993. The film was shot on location at four estates in England: Badminton House, Avon; Powderham Castle, Devon; Corsham Court, Avon; and Dyrham Park, Avon. The film was based on the Kazuo Ishiguro novel, THE REMAINS OF THE DAY, which won the 1989 Booker Prize. The original screenplay was written by playwright Harold Pinter, who had also optioned the book.